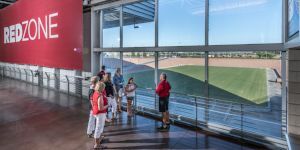 Discover why the Arizona Cardinals and Fiesta Bowl call State Farm Stadium home. Go into the areas not seen by the fans on game day including the Press Box, an exclusive Private Loft, the NFL Visiting Team Locker Room, and a look up and around from the Stadium Floor. Tours are offered Wednesday through Saturday at 10:30AM, 12:30PM and 2:30PM. Tours are not offered on Arizona Cardinals gamedays and other blackout dates apply. *Valid Photo ID is required for Senior and Military pricing. Fees may be applied. Purchasing Tour tickets in advance is strongly encouraged. What are the upcoming Tour blackout dates? *Dates are subject to change based on event schedules and logistics. Where will I go and what will I see on the Tour? The tour will stop in multiple areas on most levels of the stadium for iconic views of the stadium and photo opportunities. Tickets can be purchased in advance through Ticketmaster.com or at State Farm Stadium Box Office. Tickets can also be purchased on the day of the Tour at the State Farm Stadium Box Office. Please note that some Tours do sell out quickly, especially within the month of March. Can we schedule a Behind the Scenes Tour as a Field Trip? Yes. Behind The Scenes Tours make great field trips for elementary, middle and high school students. Visit the Private Tours page for more information. Yes! Private Tours are a great way to celebrate a birthday. Scheduled in advance, the Birthday Child will be presented with a birthday certificate and a goodie bag. The Tour last approximately 90 minutes and involves approximately 1 mile of walking. The entire route is fully ADA accessible and wheelchairs are available. A member of the party must be present and able to push wheelchair through tour route. Tours are professionally guided by a knowledgeable guide. Kids of all ages enjoy the Behind the Scenes Tour – there’s something fun for everyone. How will we get up and down the levels of the stadium? Use of elevators will be used to move from Field Level, Concourse Level and Club Level.